CORPUS CHRISTI - A trio of guaranteed giveaways, the CITGO jersey series, Astros bobbleheads, and 14 fireworks displays are among the heavy hitters on this year's promotional lineup at Whataburger Field. 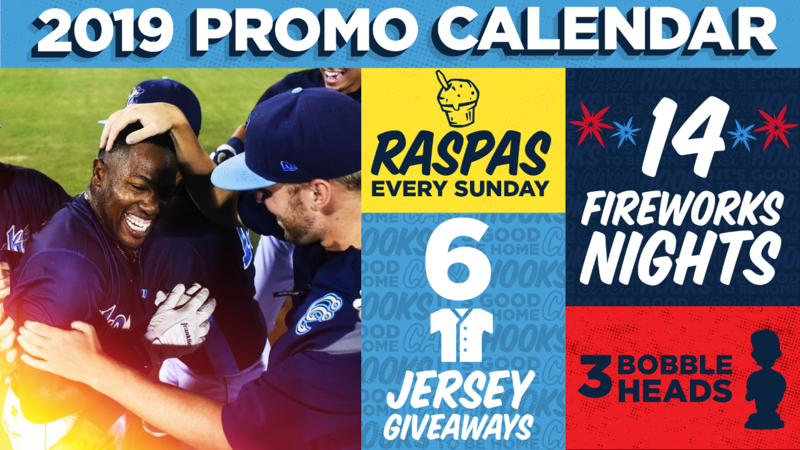 2019 also features a reprise of the Corpus Christi Raspas (every Sunday home game), Blue Ghosts (May 23-25), and Dia de los Hooks (August 1-3). The festivities begin Thursday, April 4 with Opening Night T-Shirts, presented by Mike Shaw Automotive, and postgame fireworks. Big Bounce America will be in town Opening Weekend (Friday-Sunday), giving Hooks fans the chance to fly around in the "World's Largest Bounce House." All fans in attendance on Saturday, April 6 receive Whataburger 15th Season Jerseys. Speaking of guaranteed giveaways, all fans in attendance Friday, July 5 net Astros George Springer Bobbleheads presented by Wigington, Rumley, Dunn, & Blair. And everyone in ballpark on Friday, August 16 will take home Astros Jose Altuve Sliding Bobbleheads courtesy of RBFCU. Hooks all-time favorites is the theme for the 2019 Saturday CITGO jersey collection, featuring Hunter Pence (April 27), Jose Altuve (May 11), George Springer (June 8), Carlos Correa (July 6), and Alex Bregman (August 31). The Hooks are home for Mother's Day and we are celebrating with an Astros Mother's Day Clutch presented by Driscoll Health System. The Blue Ghosts will defend Whataburger Field over Memorial Day weekend with stainless steel tumblers (AutoNation) and Dri-Fit shirts (Hilliard, Martinez, Gonzales) going to the masses on May 23 and May 25, respectively. The team is also planning Saturday afternoon batting practice on the flight deck of the USS Lexington. The weekend wraps up with a postgame-fireworks show on Sunday, May 26. Don't miss Astros Alex Bregman Stare Bobbleheads presented by First Community Bank on Friday, June 7. Kids 12-and-under get a Sammy Toothbrush Holder from Star Orthodontics on Monday, June 17. Fourth of July Weekend at Whataburger Field means back-to-back nights of fireworks for the Hooks faithful. CPL Retail Energy presents the Spazmatics in a postgame concert on Saturday, July 20. AutoNation's Pink at the Park Cap (August 17), Astros Orbit Appearance & Orbit Socks (August 18), and Hooks Oven Mitts from Mrs Baird's (August 30) round out the giveaway slate. Monday is Dollar Day at Whataburger Field with Mrs Baird's sponsoring $1 hot dogs, soda, candy, and prize-wheel spins. Tuesdays are half-price group night and Mike Shaw Automotive 4-for-$40, offering fans four tickets, four hot dogs, and four sodas for only $40. Wednesdays at "The Ballpark by the Bay" are Whataburger Family Days. Buy one adult ticket and get a youth ticket free, compliments of Whataburger. Also, families can enjoy a pregame catch on the field. The weekend lifts off with Thirsty Thursday, Bud Light Friday Fireworks, and Super Saturdays. Sunday is H-E-B Kids Day with youngsters running the bases postgame. Active military and veterans with a valid ID receive half-price reserved tickets for Military Salute Sunday. As a nod to their 15th season, the Hooks are pushing back start times to 15 minutes past the hour. First pitch is scheduled for 6:15 Monday through Thursday, with 7:15 tilts booked on Fridays and Saturdays. Sunday matinees are at 2:15 (April 7, April 28, May 12, August 18, and September 1) and 4:15 (June 9, June 23, July 7, July 21, and August 4). Sunday, May 26 is a special 6:15 start time. The regular-season Labor Day finale is slated for 2:15. Visit cchooks.com, call 361-561-HOOK (4665), or stop by the Whataburger Field Box Office to purchase tickets. Click Here to learn more about Hooks Season Memberships, including the new Seven Game Super Voucher.